1 Fair conduction of elections of the Houses of Parliament and to the House or Houses of the Legislature of each State. 2 The qualifications and disqualifications for membership of those Houses. 3 The corrupt practices and other offences. 4 Decision of doubts and disputes. It can also be stated as short title for legislation enacted by the Parliament of India dealing with the electoral system. A person can file his nomination even though he is shunned from being voting owing to be in jail or in police custody during elections or before. 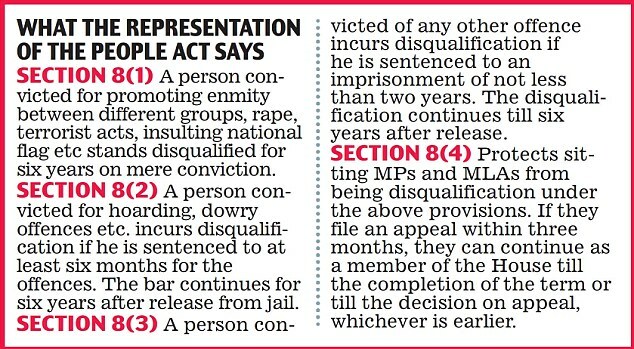 The past act has not defined on what grounds, a person can be disqualified. In this act the grounds are clearly stated as disqualification can be on conviction for certain specified offences and can be on no other ground. As a result if one is proved for any conviction of any one of the offences, then he/she name will be wiped off from electoral roll and shall cease to be a voter. But SC in the month of July said, that a person in jail or police custody is not entitled to vote, and therefore, is not an elector, and thus, cannot contest elections. Hence forth a need for a second amendment has emerged. II. And the sentence is stayed by the court. I. The legislator can continue to take part in proceedings of the legislature. However, the legislators will neither be entitled to vote nor draw salary or allowances until the appeal or revision is finally decided in court. II. If a stay is not obtained by the legislator within three months against the conviction, the legislator would stand disqualified. But SC says, the parliament has exceeded its legislative lenience in making these provisions. This bill will sits in Rajya Sabha now and perhaps stands on toes during winter session.